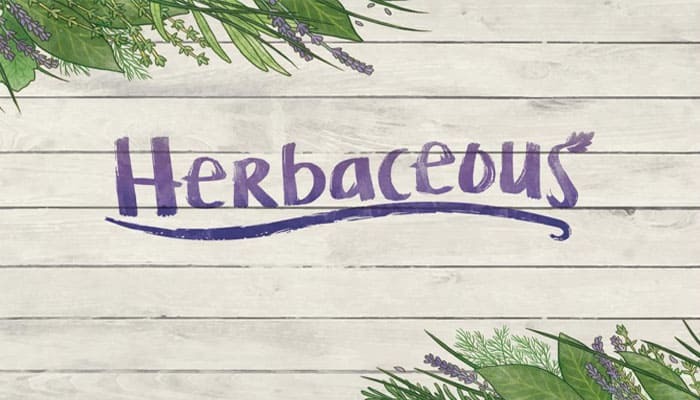 Everyone has a green thumb when playing Herbaceous. 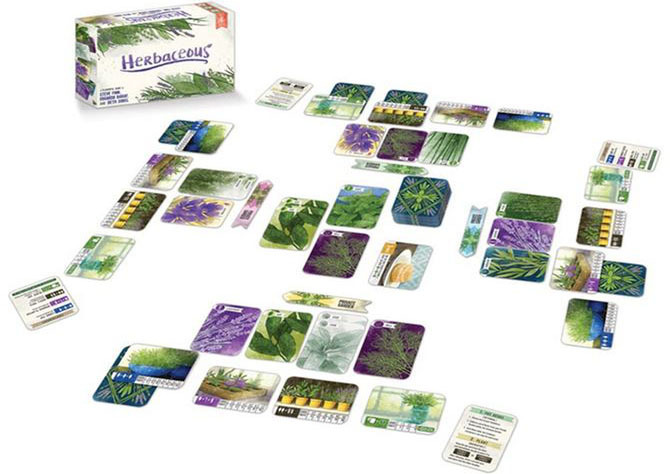 Relax while enjoying this beautiful and elegant game of picking and potting herbs. Pot the best collection of herbs in your containers, but don't wait too long or your friend might grab them first. Players try to score the most victory points by collecting and potting herbs from the Community Garden and their Private Garden. 1 Each player receives 4 Container Cards , the back of the card is the player's color. 2 Shuffle the Herb Cards and Special Herb Cards (72 cards) together into a deck. Place deck face-down as a Draw pile. 5 Designate an area for cards in the center for the Community Garden A and an area in front of each player as their Private Garden B. 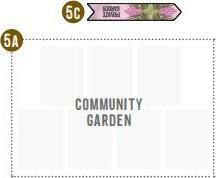 Each player places a Garden Marker in their color between their Private Garden and the Community Garden. C.
6 Place the Herb Biscuit Card to the side of the playing area within reach of all players. Chooses 1 of their 4 Container Cards to use. Collects a set of Herb Cards specified by the chosen Container Card and then tucks them under the Container. Herbs may be taken from the Community Garden and/ or a player's Private Garden in any combination. Each Container Card may only be used once per game. The player may only pot one Container a turn. Important: Special Herbs may ONLY be potted in the Glass Jar Container. (Identical Herbs) For this container, collect 1 to 7 Herb Cards of the same type. For example, 6 Lavender. (Different Herbs) For this container, collect from 1 to 7 different Herb Cards. For example, 1 Bay, 1 Saffron, 1 Rosemary, 1 Dill, and 1 Tarragon. (Pairs of Identical Herbs) For this container, collect from 1 to 6 pairs. Each pair must be different from the others. For example, 2 Sage, 2 Dill, and 2 Bay. (Regular and/or Special Herbs) Any 3 Herb Cards can be potted into this container. They can be the same or different. On the first turn of the game, Step 1: Pot Herbs is not possible because there are no cards played yet to pot. If a player pots each value of Special Herb (1, 2, and 3) into the Glass Jar, that player immediately earns the Herb Biscuit, which is tucked under the Glass Jar container. It provides 5 bonus points at the end of the game. Only one player can be awarded the Biscuit in a game. Then draws a second card and places it in the location not chosen by the first card. 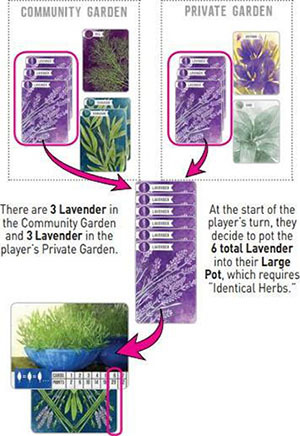 In other words, if the first card was placed in the Community Garden, the second must be placed in the player's Private Garden (and vice versa). Even if a player has used all of their Containers, they still participate in the Plant step on their turn. After the deck is exhausted, players keep taking turns collecting Herbs. Once a player cannot pot any more herbs, that player stops. Continue until everyone has either used all of their container cards or until it is not possible for anyone to pot anything. Each Container Card lists at its bottom how many points are earned for the number of cards collected. For the Glass Jar, each Special Herb scores an additional bonus of the amount shown on the card. Also, earning the Herb Biscuit adds 5 points. The player with the most points wins. In the event of a tie, the player whose Glass Jar has a higher total wins the tie. If there is still a tie, those players all win and should break bread together.